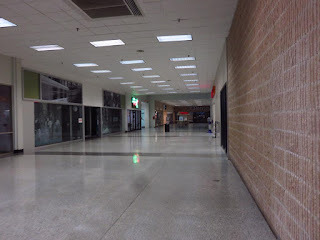 A few years ago, I had a chance to tour for the first time one of the oldest malls in North Carolina, a simple dumbbell shaped mall that has now reached its end. 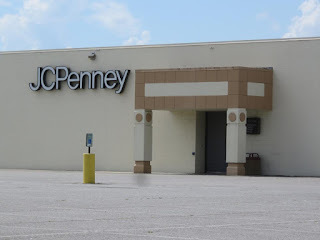 Plans to demolish the mall this year have already been announced and the JCPenney store has already been demolished, so I advanced this post to showcase this mall in its antique glory before it is lost to the dustbin of history. As the last and only enclosed mall found in Northeastern North Carolina, it should have been so much more, but weak economic factors in the region made it unable to expand or survive. 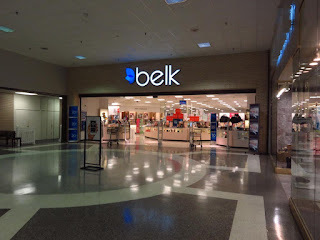 As the location of one of the first ever modern Belk prototype stores, it deserves a mention despite being rather unimpressive by modern mall standards. 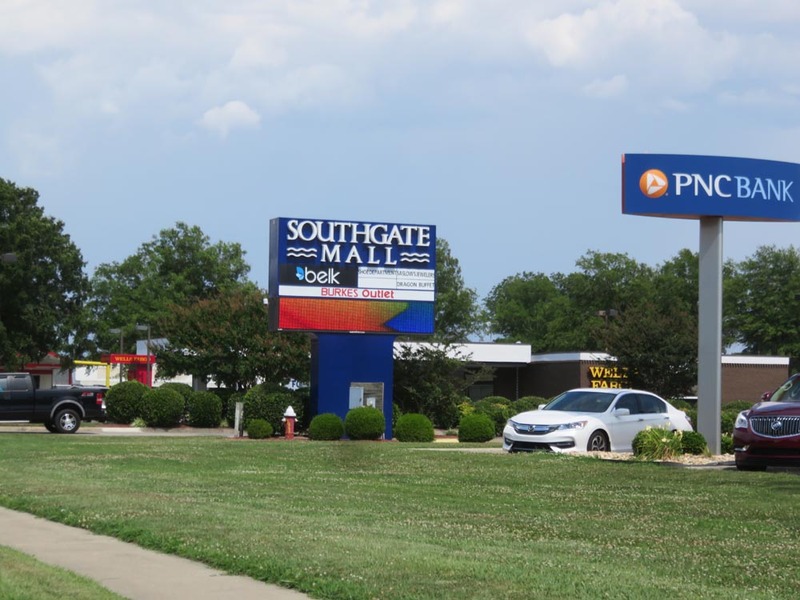 Constructed from 1967-1969, Southgate Mall opened with four anchors: Belk Tyler, Grant's, Winn-Dixie and People's Drugs. It is unclear who originally built the mall, but it was owned throughout much of the 1970's and 1980's by Federal Realty. 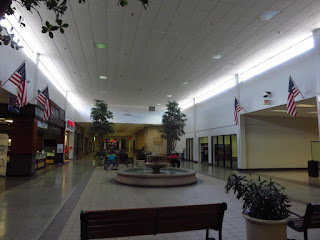 Its design was essentially a small town mall combining typical strip mall tenants with a regional department store in an enclosed mall. 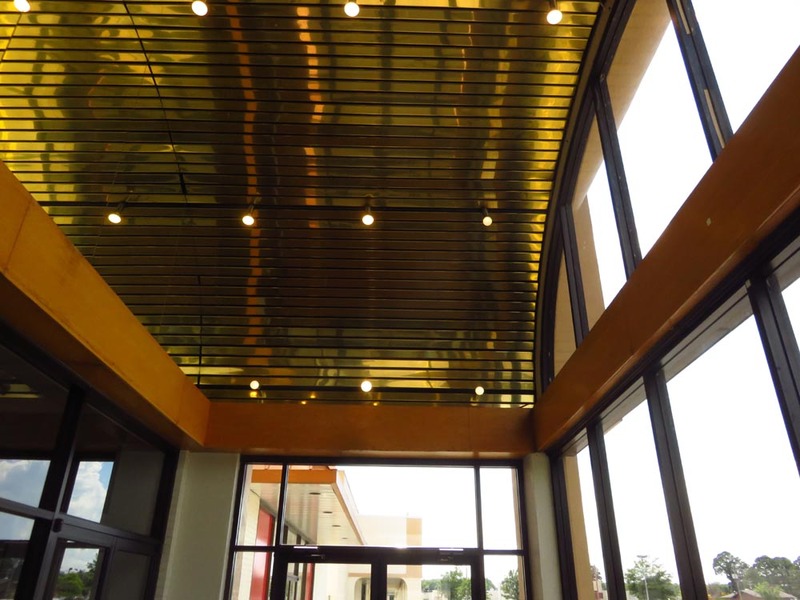 Its design features an front and rear entrance corridor, main corridor and spacious center court with high ceilings and high windows functioning as skylights: a design very common in malls constructed in the 1965-1973 period. 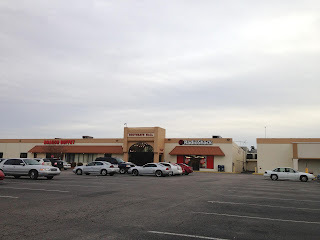 Next to the mall on the west side, a Gateway Cinema was opened in 1973 and right behind it to the right a Mammoth Mart discount chain. This anchor lineup obviously could not last considering that Winn-Dixie has been gone from North Carolina for 12 years and none of the other stores still exist. Grant's was obviously the first to go, closing their store at the mall in 1976. Regional discount chain Roses arrived to quickly fill the void left by Grant's. 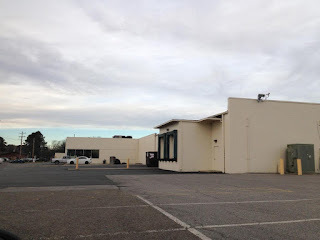 It was odd that Kmart did not actually take over that store, but Kmart itself would not appear in Elizabeth City until 1982! Entering center court with view of the back entrance wing and center court skylights. A couple more views of center court and the now-removed fountain. I can only imagine that a far more substantial fountain was in center court prior to the 1990's. From the flooring patterns in the photo, it appears that the fountains and planters stretched the entire length of the center court and likely included a sunken area. 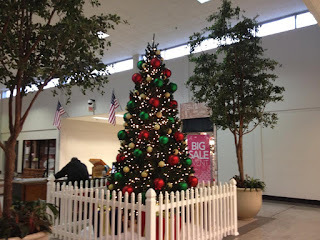 Christmas display from January 1, 2014. You got the feeling even then that the mall was not long for this world despite the festive feature. A view to center court from the healthier Belk wing. Photo from January 1, 2014. A view to center court from the JCPenney wing. Photo from Jaunary 1, 2014. 1982 saw the next anchor shift as Winn-Dixie left the mall to join that same Kmart at the then-new Holly Square shopping center. This left a void in the mall at a time when, unlike today, department stores were actually expanding and looking for new malls to anchor. 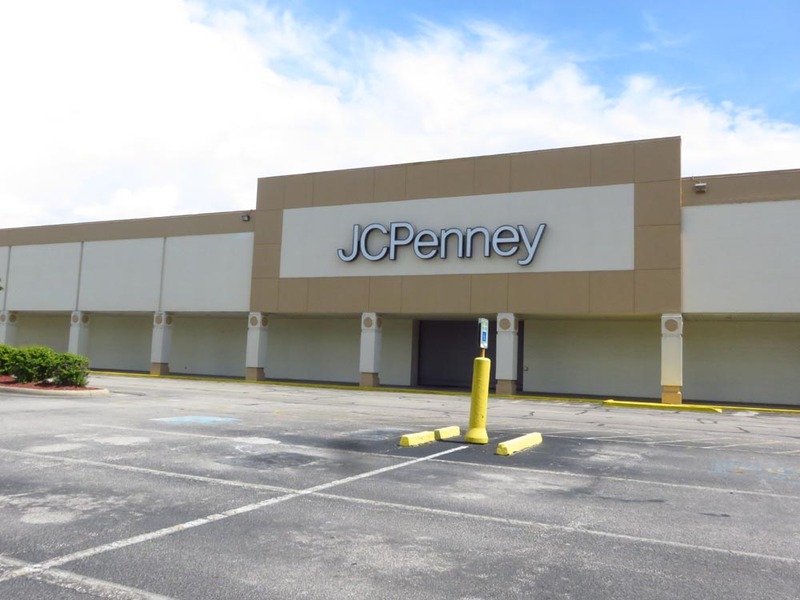 Thus, around 1985 JCPenney relocated from their downtown store to take over the former Winn-Dixie space. 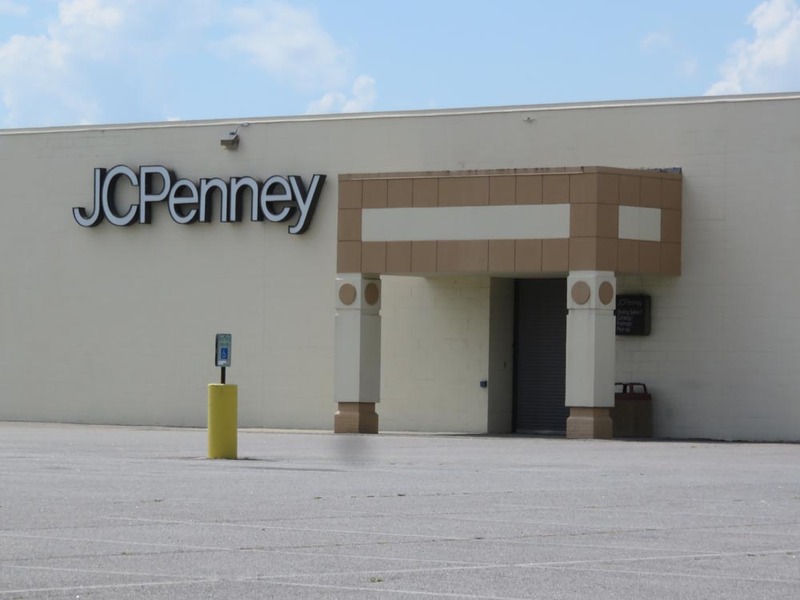 It was a compact apparel-only store for JCPenney, and it ultimately would prove too small for them. The opportunity opened up when in 1993, Roses closed their store and left town. At the time, Roses was still an actual discount chain and was feeling the sting from Wal-Mart's expansion. 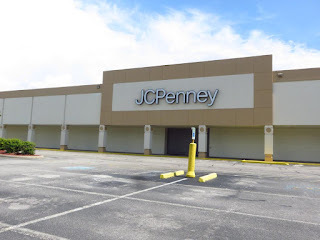 JCPenney seized on the opportunity and relocated their store into the outer 2/3 of the former Rose's in 1996. This project was coupled with a small expansion of the mall into part of the old Grant's space. Belk's mall entrance is obviously one of the most uneventful they did in the 60's, but it is also one of the very oldest mall-based Belk stores, so it still was bound to look a lot better with "Belk Tyler" sprawled across the front. 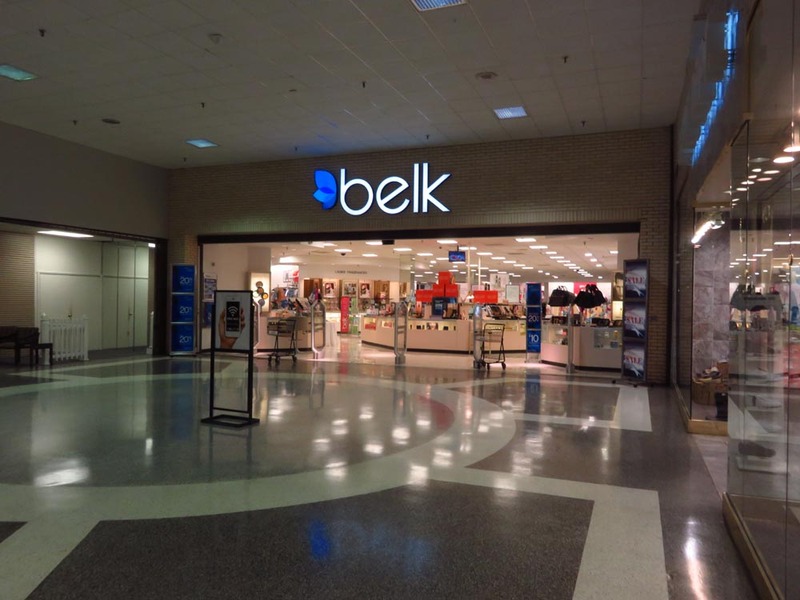 Throughout the 1970's and 1980's, Belk built some of the classiest mall entrances in the industry. A look at the front entrance corridor in both directions. Plenty of unused space in this hallway suggesting they just covered up the empty stores. 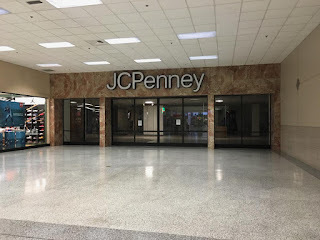 It appears that the mall's last renovation coincided with JCPenney relocating their store into the old Grant's/Rose's meaning it also occurred in 1996. 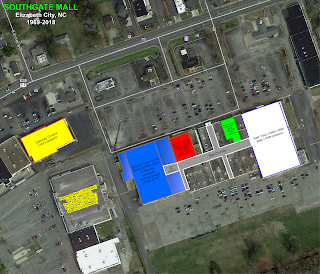 Since the mall space was expanded into part of the former store to reach the new JCPenney, this makes sense. 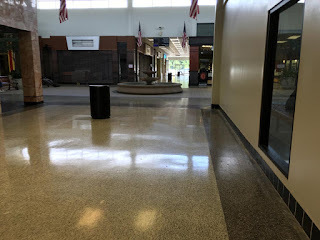 That renovation appears to have also taken out what appears to have been a far more spectacular center court replacing what was likely a larger fountain and planters with a smaller, more subdued fountain and more floor space. Hibbetts Sports took over part of the old Grants space next to JCPenney as part of this expansion. The changes were not dramatic enough to completely rob the mall of its vintage appearance, however, and much of the mall still maintains much of that early 1970's look and feel: a situation that has not been beneficial in more recent years. After JCPenney moved, Goody's would come into replace the former Winn-Dixie/JCPenney space in 1998, but they would only stay a few years. The 90's closed out with Belk Tyler converting to just Belk and People's Drugs becoming Revco in 1993, then CVS in 1998. While turnover was high, the mall was small enough to sustain this, thus it was pretty much running steady through all of this. 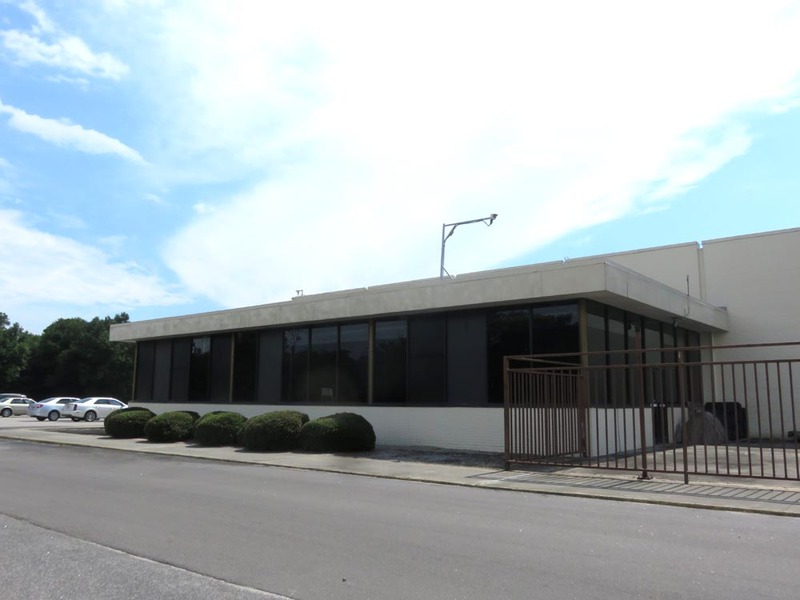 Original 1969 Belk including a rare design pre-dating the standard 1970's brick arches. Belk is still committed to the mall and its redevelopment. Belk Tyler included a garden center, a very rare concept that was only on a few Belk stores. 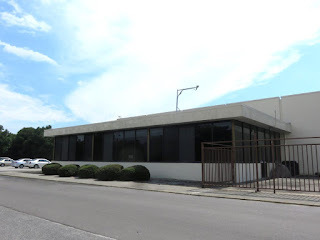 The former garden center is unused, but is not in disrepair. 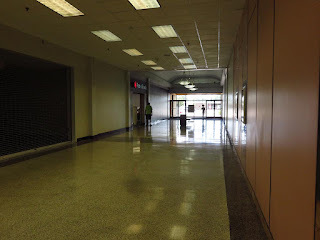 Overall, the coming and goings in the junior anchors at Southgate Mall were like musical chairs. 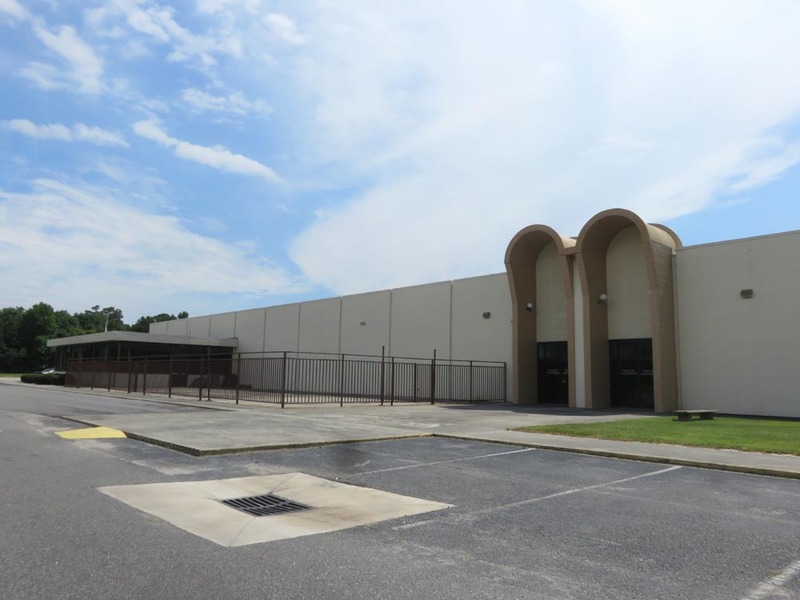 The original Winn-Dixie space housed five tenants. 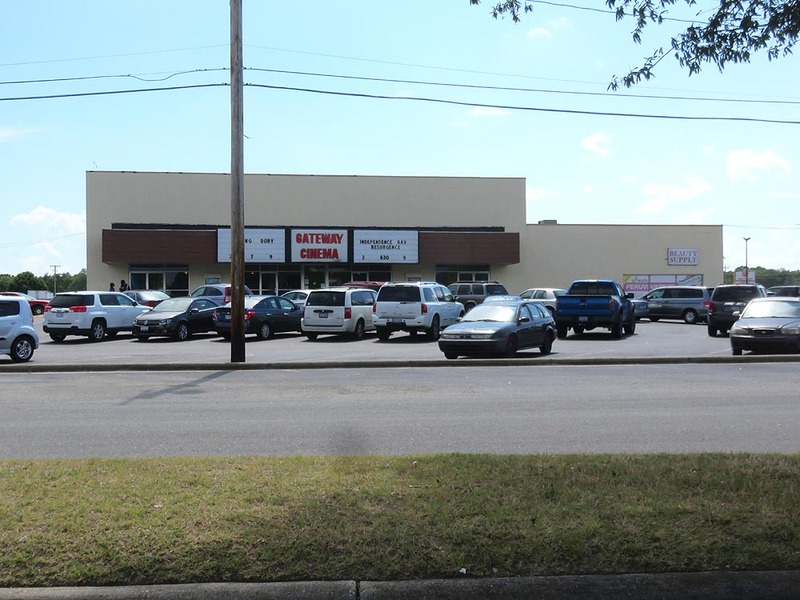 The former People's Drug housed two other drug store chains before becoming at least three other restaurants, the most current being Dragon Buffet. 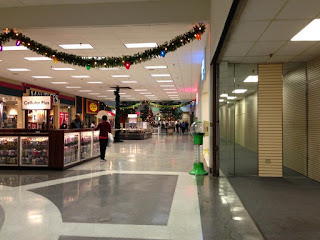 The Grant's changed two more times, and the mall was expanded into part of it. 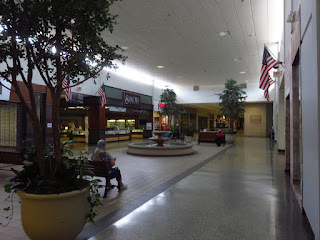 Roses, which departed the mall in 1993, came back with their "Roses Express" format taking over the former Winn-Dixie/JCPenney space. Roses then quickly outgrew this space and relocated into the former Mammoth Mart that had just been vacated by a replacement store for the Holly Square Winn-Dixie. The Mammoth Mart building had many uses itself operating as King's Department Store from 1980-1983 and Farm Fresh from 1983-1997 before becoming Winn-Dixie Marketplace and later Roses. Yes indeed, the current Roses that is just west of the mall located in what had been a 1990's replacement store for the Winn-Dixie that replaced the original mall Winn-Dixie! To make things more confusing, former anchors moved around the city fairly close to the mall. 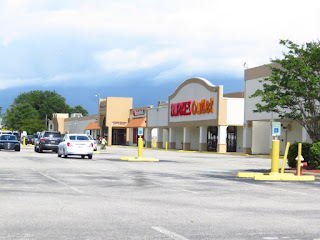 Both Winn-Dixie and Kmart relocated from Holly Square by that time with Kmart the first to relocate in 1993 and Winn-Dixie in 1997. Holly Square sat mostly vacant for a time before finally being demolished in 2004 for Lowes after its last tenant Big Lots relocated from the older dead Kmart to part of the newer dead Kmart! CVS also left the mall around 2003, relocating to a free-standing location one mile to the east. 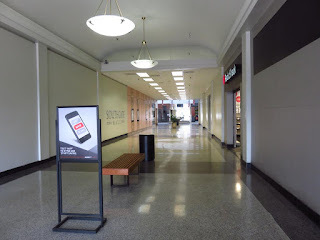 A look down the JCPenney wing in 2016. 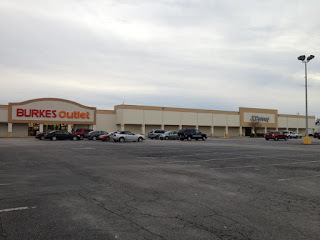 Burkes Outlet (formerly Winn-Dixie, JCPenney, and Roses Express) is on the right. 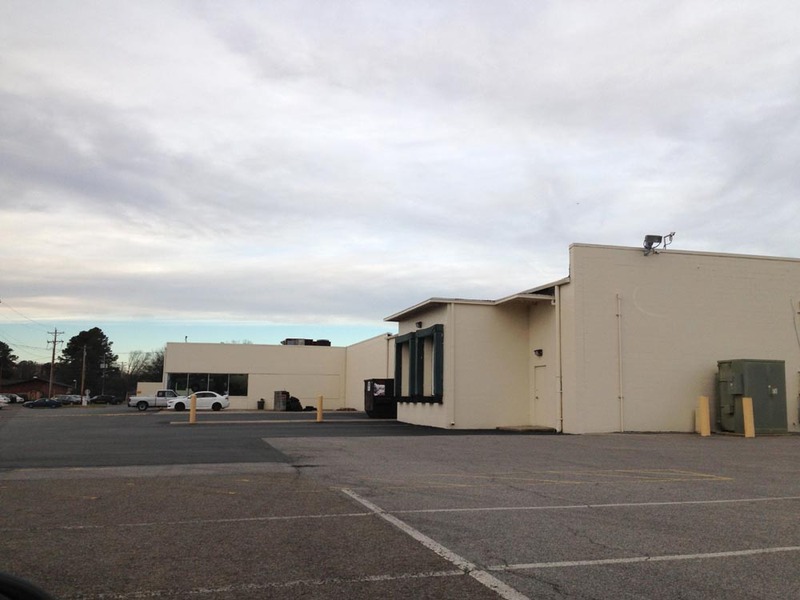 The 1996 addition into what was Grant's/Rose's is visible just beyond the entrance hallway on the left. 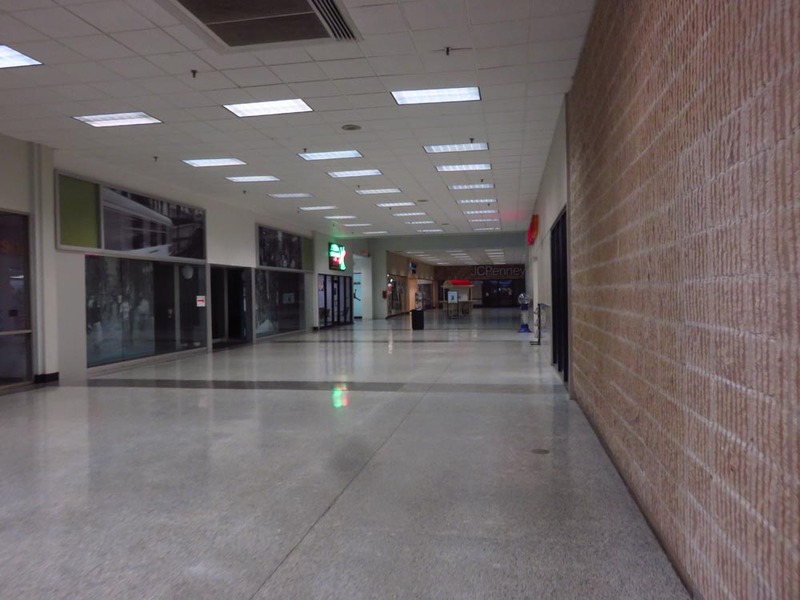 A look back to January 2014 when JCPenney was still open. You can clearly see here how the hallway was extended for the store. After 2010, the mall's struggles ramped up with the retail industry. 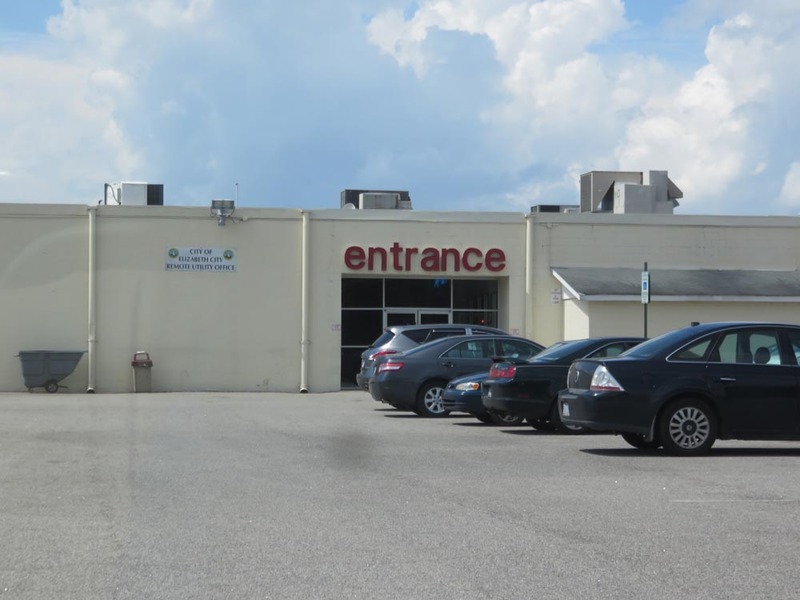 Despite a steady growth rate in the region due to the proximity to tourism in the Outer Banks, the antiquated mall coupled with industry changes and high poverty rates in the region led to vacancies becoming more difficult to fill. This escalated when JCPenney finally gave up on the mall. 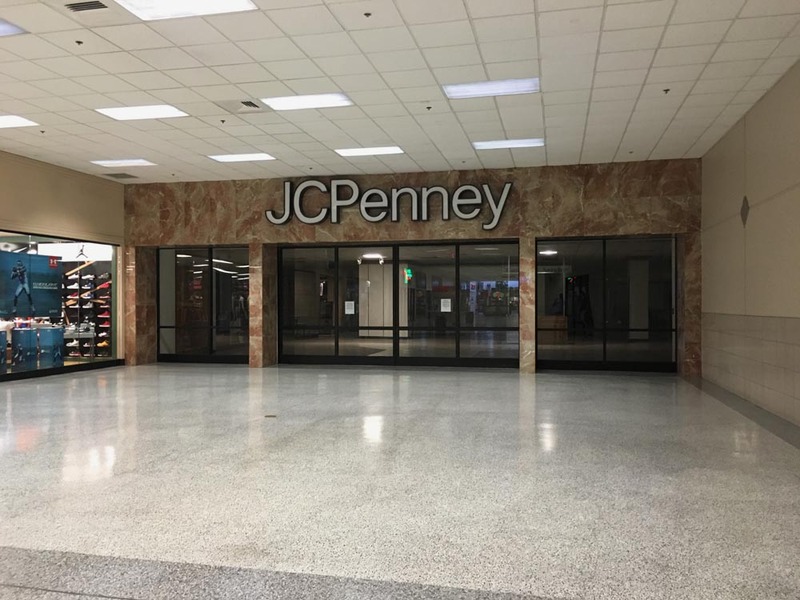 JCPenney closed their store at the mall in 2016 ending a 30 year run at the mall in two separate locations. 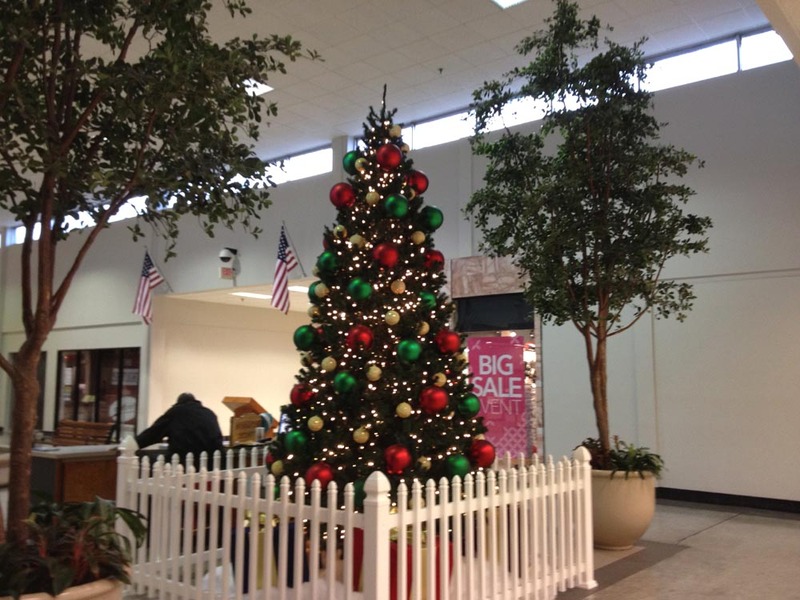 However, Belk proved to be far more established at the mall and renovated their store within the same year. This ultimately meant that Southgate Mall was a dying mall anchoring a successful Belk and Burkes Outlet. 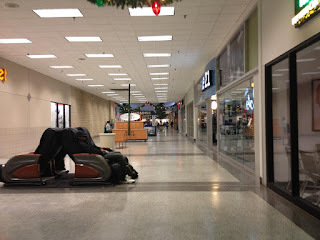 It was becoming painfully obvious that the location of the mall was not the problem, it was the mall itself. 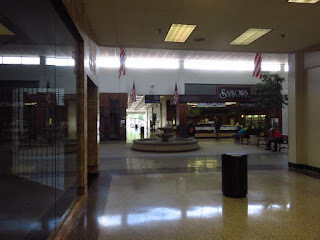 Main mall entrance to Southgate Mall. Close-up shot from July 1, 2016 and setback shot from January 1, 2014. Detail of inside of interest with the brass panels. It's a fascinating touch. JCPenney front entrance with obvious details left over from Grant's. 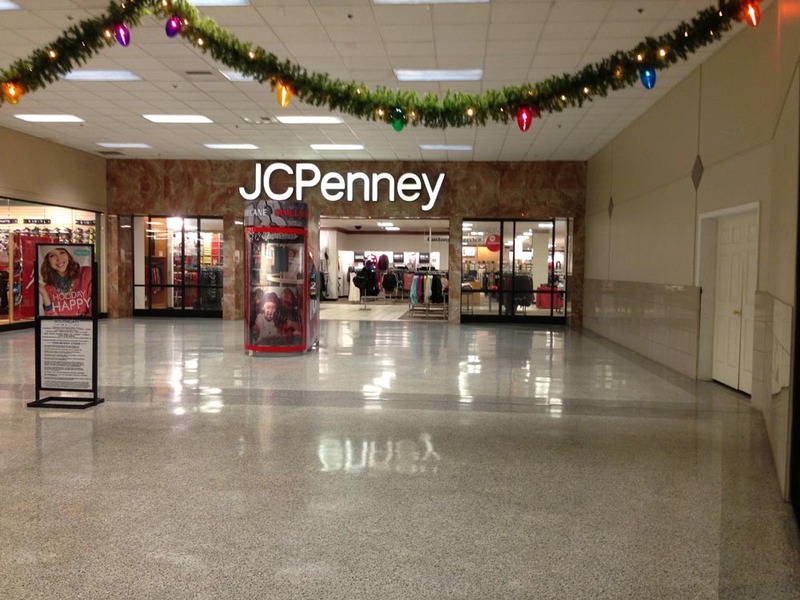 When JCPenney took over the old Grant's/Rose's, they had to cut a new entrance into the back. Otherwise, it looks like a typical unremarkable 1970's discount store from the rear. 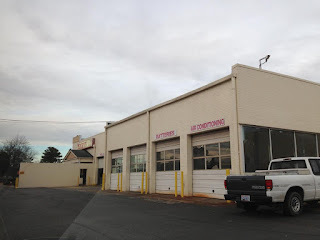 Grant's Auto Center was obviously sold off long before JCPenney took over the store, but they were probably forced out for the store's demolition. 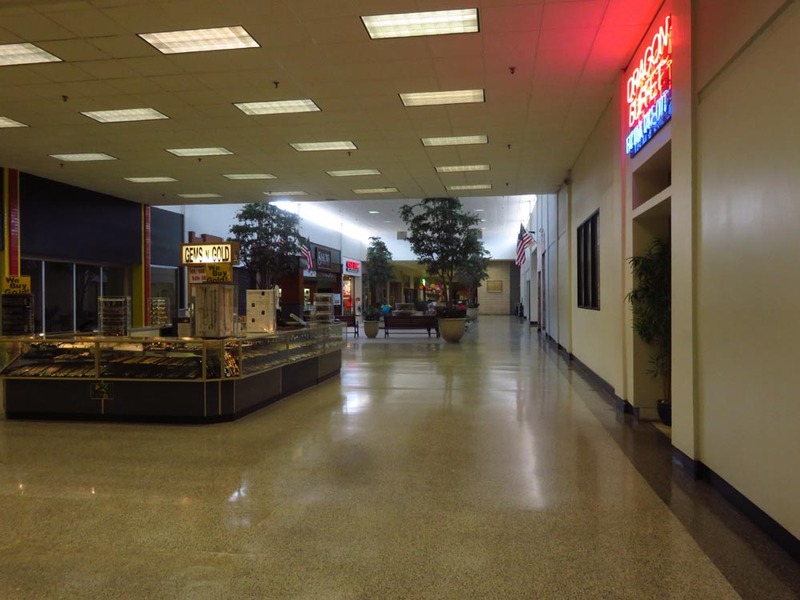 According to Dailyadvance.com, it was announced in February 2017 that the mall was sold in an auction for $2.3 million. It had been sold the previous July for $8 million, and prior to that it was owned by ABC Properties of New York City since 2005 until they defaulted on the mortgage. 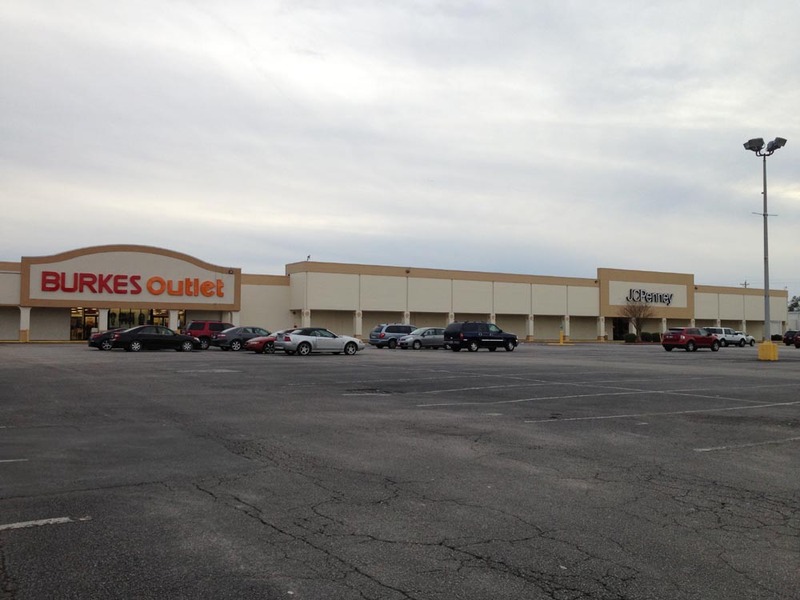 The new owners were not coy about their plans for the mall. 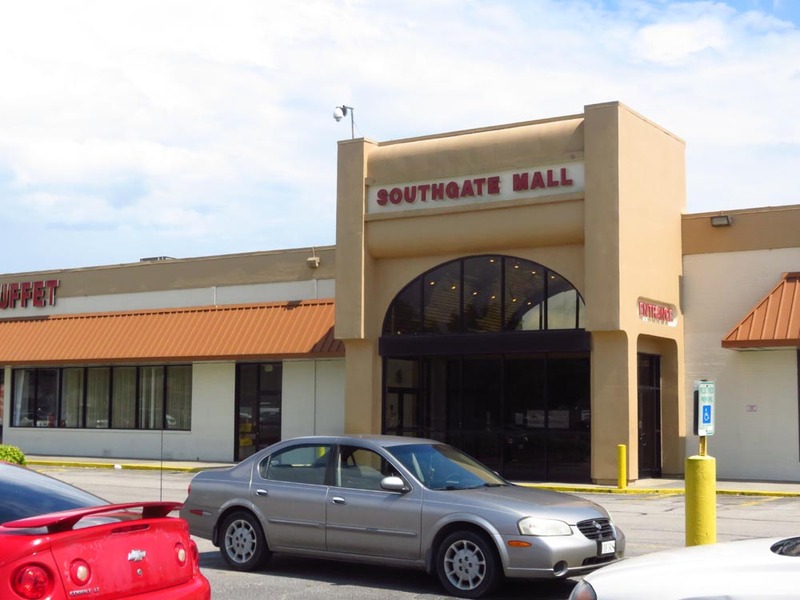 By July, it was announced that the interior mall of Southgate Mall would be closed and torn down after nearly 50 years of business. 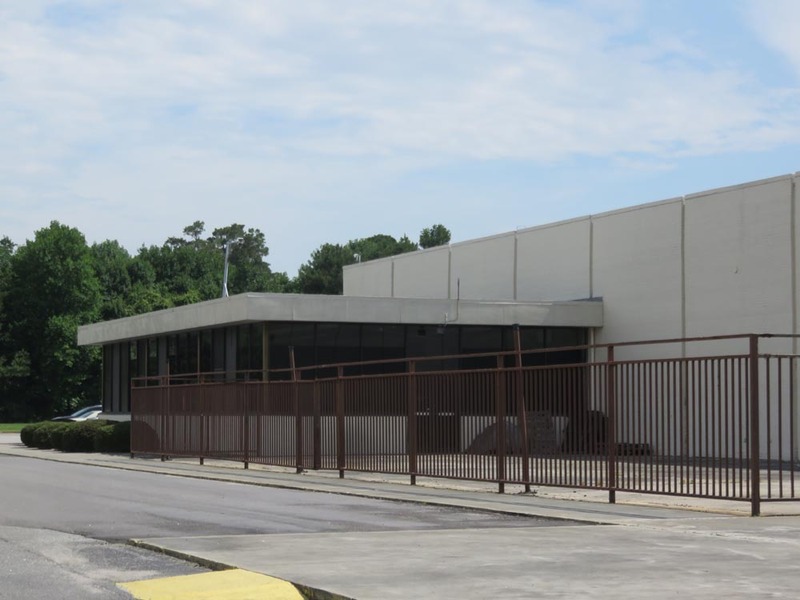 This announcement came as somewhat of a surprise considering that the mall still has active tenants inside, Belk is committed to the mall, and Burkes Outlet is still operating in the former Winn-Dixie space. 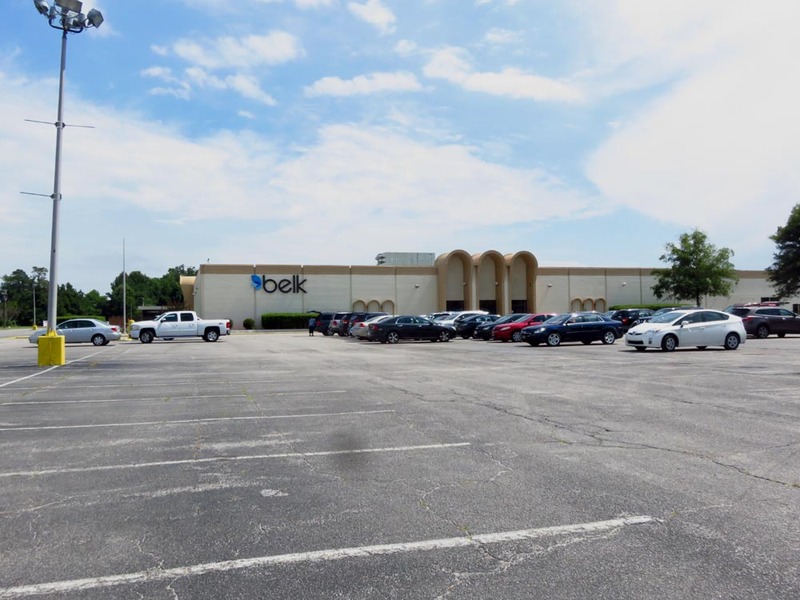 In other words, the new owners simply do not think they can rework the interior mall in any way to make it successful again, thus the center will be transformed into a traditional strip shopping center with Belk as an anchor tenant. A couple front view of the mall with the top photo looking from JCPenney to Belk and the bottom photo looking at Burkes Outlet (former Winn-Dixie, original JCPenney), and later JCPenney in what was Grant's/Rose's. 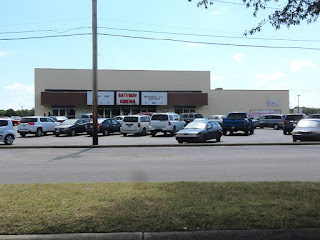 Rose's is now located in what was the third Winn-Dixie just west of the mall. The mall theaters to the right of the mall. 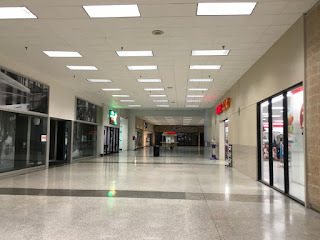 They did not open at the mall and were instead added in 1973. Historical map of the mall showing anchor history of the mall and its outlots 1969-present. The 2018 date refers to the pending demolition of the remaining interior mall. Too many things in the past 15 years have begun to work against the mall. The primary issues were newer competition, an antiquated mall design, and traffic pattern changes. 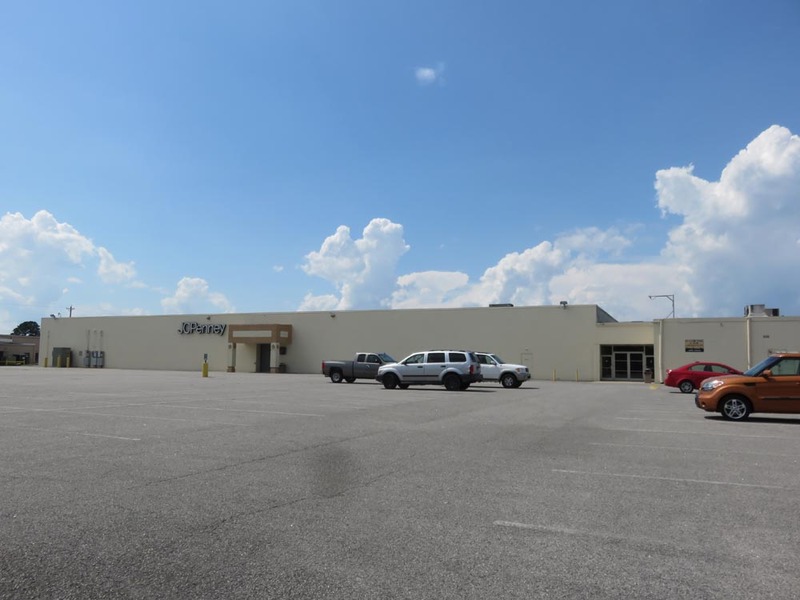 First, the construction of The Shoppes at Tanglewood (a strip adjacent to a Wal-Mart Supercenter) helped pull traffic, inline tenants and customers away from the mall. Second, as a mall much closer to downtown, the mall also suffered from a change in traffic patterns as US 17 was relocated to a new by-pass west of the city. 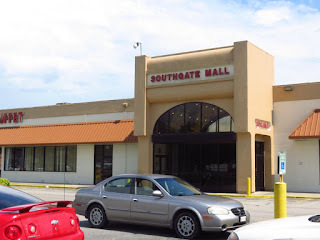 While not particularly unique for its time, Southgate Mall is one of the very last representations of early enclosed malls, and its demolition will be another stinging loss as it joins many other malls across the country closing for good. 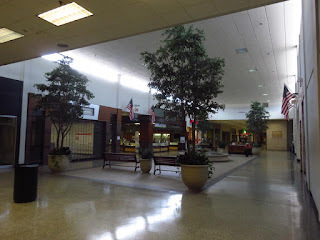 At least these photos will help us to remember this quaint little mall.